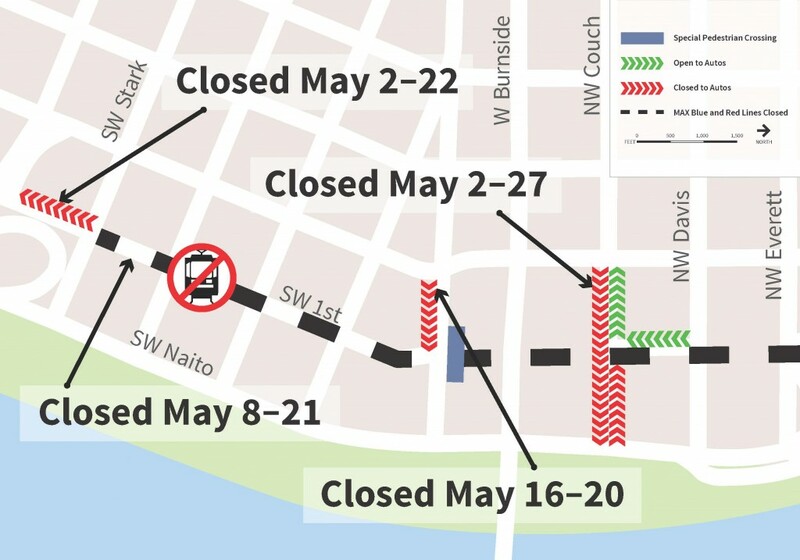 Two streets in downtown Portland will close Monday, May 2, including NW Couch Street, as preparations begin for TriMet’s 1st Ave MAX Improvements project. During the project, the MAX alignment on 1st Avenue from SW Morrison to NW Davis will be shut down as crews replace switches under the Morrison Bridge and at NW 1st and Couch. A section of curved rail also will be replaced near Skidmore Fountain, along with other work. The project will increase MAX reliability and create a smoother ride, but it will disrupt three MAX lines and reduce frequency on all lines leading to extremely crowded trains May 8 through May 21. Beginning May 2, crews will begin staging equipment, rail and other materials for the project and some work will begin next to the MAX alignment. That will affect a few streets nearby. The plan is to keep sidewalks along the work zones on 1st Avenue open, but crosswalks across 1st at Couch will close starting May 8. The crosswalk across 1st at Ankeny will close starting May 16, but a temporary crosswalk just to the north of Ankeny will be created. The MAX improvements will create a better service along 1st Avenue, but the work done at NW 1st and Couch also will benefit pedestrians, cyclists and motorists. Dips in the intersection and broken pavement, cobblestones and bricks will be fixed. From May 8 through May 21, MAX Blue, Green and Red lines will be disrupted, and all MAX lines will run on reduced frequencies. That means fewer trains will be running and room onboard will be limited so riders should expect extremely crowded trains, especially during commuting hours. Consider altering trips to travel outside of rush hours, working from home if possible, taking TriMet’s regular bus service, carpooling, biking or using other transportation options during the two-week project. Go to trimet.org/firstavenue to get line-by-line details, view an animated map of the service adjustments and check train schedules during the project.